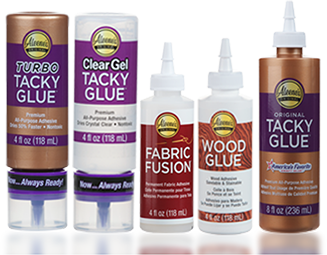 Aleene’s Original Glues - Can I make clay with glue? Can I make clay with glue? Remove the crust from a slice of bread (white bread is suggested for best results when coloring the clay). Tear the bread slice into small pieces and place in a disposable plastic bag, then add 1 tablespoon of Tacky Glue. Add a few drops of acrylic paint to color the clay if desired. Clay can also be painted after drying. Knead the bread and glue within the bag until thoroughly mixed and a clay starts to form. Remove the clay from the bag and knead until fully formed. Note: if mixture is too runny, add more bread pieces in small amounts. Use clay to make desired item, then let dry overnight. Paint with acrylic paint if desired, let dry, then seal with your favorite sealer.